According to William F. Hoffman the author of Polish Surnames: Origins and Meanings. Your Family Name, Krzyzanowski: Polish Family of Notable Dignitaries. 1980 Twin Circle Article. Hans-Joachim Krzyzanowski tells us how the name relates to a famous catholic order of the knighthood. William F. Hoffman revisits the subject with a Teutonic Knights connection. Joachim Krzyzanowski writes about his research and describes a Krzyzanowski coat of arms. Martin Krzyzan's research into his name brought another reply from William F. Hoffman. Hall of Names International Heritage Classic History Scroll. The New World Book of Krzyzanowskis published by Halbert's Family Heritage. The ultimate root is _krzyz*_, "cross" (I use z* to stand for the Polish dotted Z, pronounced much like "zh" in "Zhivago"). But usually names ending in -owski derive from the names of places where the families once lived, centuries ago. We'd expect this surname to mean "one from Krzyz*anow or Krzyz*anowo" or some other place with a name beginning Krzyz*an-. That place name, in turn, is what derives from the word for "cross." So the place names mean something like "place of the cross" or "place of the man of the cross," and the surname means "one from the place of the cross/place of the man of the cross." So all the surname really means is that at some point centuries ago your ancestor came from any of a number of villages called Krzyz*anow or Krzyz*anowo or Krzyz*anowice, named for some connection with crosses. As of 1990, according to the best data available (the _Slownik nazwisk wspolczesnie w Polsce uzywanych_, "Directory of Surnames in Current Use in Poland," which covers about 94% of the population of Poland), there were 12,027 Polish citizens named Krzyz*anowski. They lived all over Poland (probably because there are places with the names I mentioned all over Poland); there was no one area with which the name was particularly associated. So I'm afraid the only way to determine which place a given Krzyz*anowski family took its name from is through successful genealogical research. Once you manage to pin down the exact area the family came from, at that point you may be able to find something that helps you establish "They took their name from this nearby place right here, with a name beginning Krzyz*an-." Determining that is beyond the scope of what I can do -- but it may be something you can do! 2. Your Family Name, Krzyzanowski: Polish Family of Notable Dignitaries. 1980 Twin Circle Article. 3. Hans-Joachim Krzyzanowski tells us how the name relates to a famous catholic order of the knighthood. 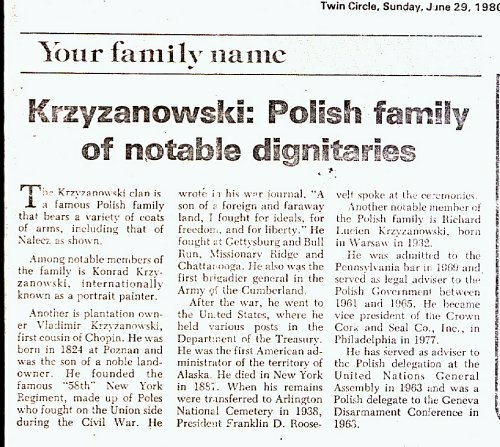 Referring to the 1980 Twin Circle article "Your Family Name, Krzyzanowski: Polish Family of Notable Dignitaries". My nephew Helmut Hellmig picked up adove mentioned article. Very interesting! I myself, did a little research on the history of our family, coming from Waschkowitz/Litovia, 18th century, and Turon-Posen, up to 1918. It might be interesting to you, that our name, far back to the 15th century, leads to a member of the famous catholic order of the knighthood " Kreuzritter " (Kreuz = Cross = Krzyz) being at first a medical corps during the crusades into the holyland. Becoming later heavy waponed elite- riders in the first line. They have been called by the polish Duke of Masowia to christianise the Pruzzen tribe in the northern part of Poland and Litvonia. Mostly german but likewise duch, French and schottisch noblemen. The order in the 15th century converted to protestanism . My or probably out forfather did not follow and left the order or had to leave. That time in the polish-litvonian region there were no surnames, but just Christian names and some describing: Anton the smith, baker or... the Krzyzanowski. Refuring to my family, which mainly was not in conformity with the spirit of the age, we often had to restart from the beginning. In the 18th century, my forfather Anton Krzyzanowski, living in Waschkowitz / Litvonia, merried a protestant women, what was marked with protest from the government. The women died while becoming a child. He married her sister. A protestant again! They had to leave. Up from that time, we are German protestants. My grandfather was the head of the financ-office in Thorn (Turon / Weichsel) up to 1913. My father was a school-director and I had been a advertisingmanager. I am retired and live together with my wife, dog and boat close to Berlin. All that is left from former times is a signed ring, showing a cross and two halfmoons inside. I hope that I could help you a little going back to the roots of a family with a distinct name. 4. William F. Hoffman revisits the subject with a Teutonic Knights connection. A connection with the Teutonic Knights, or Knights of the Cross, is quite possible. In fact, I'm rather upset I didn't mention that possibility in my note. The Teutonic Knights were of enormous importance during Poland's early history, and it would not be in the least surprising if some names incorporating the word _krzyz*_, "cross," had something to do with the Teutonic Knights. (Remember that I'm using z* to stand for the Polish z with a dot over it, pronounced "zh"). The normal term in Polish for a member of this Order is Krzyz*ak (dot over the second z) rather than Krzyz*an, so we cannot conclude that the name Krzyz*anowski must refer to the Order in every case. The surname is more likely to refer to various places named Krzyz*anow, Krzyz*anowice, or something similar. Those places, in turn, may have been named from some connection with the Teutonic Knights -- perhaps they met there, or a Knight owned the estate, or founded the village, something along those lines. In other words, your conjecture is certainly plausible. The thing is, the only firm conclusion we can draw from the surname itself is that there is some kind of connection with a cross. It may refer to a connection with the Order, or it may not. Only detailed research into a specific family will establish exactly how this surname comes from the word for "cross." The possibility that that word refers to some association with the Knights is certainly worth keeping in mind as you research, and perhaps you will find some bit of info that will settle the matter, one way or the other. I hope this is some help, and wish you continued good luck with your research. 5. Joachim Krzyzanowski writes about his research and describes a Krzyzanowski coat of arms. Recht herzliche Gratulation zu Ihrer Hompage! Es gibt noch weitere Hinweise. Ich habe mich diesbez�glich an das Institut f�r Slawistik Abt. Polonistik an der Humboldt Universit�t zu Berlin gewandt. Von dort erhielt ich von Frau Dr. Hanna Burkhardt am 21. Juli 1998 folgende Antwort. I contacted the sklavic department at the Humboldt University in Berlin with regard to this matter. I received the following answer from Dr Hanna Burkhardt an July 21st 1998. "Wie meine Recherchen gezeigt haben, stammt Ihr Namen von dem Vornamen Krzysztof-Krzyzan-Christian- griechisch Christophoros, d.h.derjenige, der Christus bringt, ihn im Herz (?) tr�gt. die Krzyzanowskis sind ein altes adliges Geschlecht mit dem Wappen Debno bzw Swinka. In den Jahren 1750 - 1832 haben auch Neophyten, d.h. neugetaufte, patronymische Namen angenommen." [ed note: this is not going to be easy!] My research shows that your name has it's roots in the names Krystof Krzyzan and Christian or the greek version Christophoros which means one who brings Christ, or carries him in his heart. The Krzyzanowskis are an old noble line under the coat of arms "Debno" and/or "Swinka" In the years between 1750 to 1832 many newly Christened took the names of nobles. 6. Martin Krzyzan's research into his name brought another reply from William F. Hoffman. In Polish KRZYZAN is usually written with a dot over the second Z, which I indicate online as Z* (because you have to reconfigure your browser for the Central European character set to see the Polish character, and it's more trouble than it's worth). Polish name expert Prof. Kazimierz Rymut mentions the name KRZYZ*AN in his book _Nazwiska Polakow_ [The Surnames of Poles]. He says it appears in records as early as 1136, and comes from the noun _krzyz*_, "cross." The suffix -an does not have any one set meaning, it just means "of, from, pertaining to." Thus Krzyz*an would mean something like "man of the cross." It would be comparable to the German names Kreuz and Kreuzer -- not exactly the same, but similar in basic meaning. As of 1990, according to the best data available (the _Slownik nazwisk wspolczesnie w Polsce uzywanych_, "Directory of Surnames in Current Use in Poland," which covers about 94% of the population of Poland), there were 492 Polish citizens named Krzyz*an. The largest numbers lived in the following provinces: Bydgoszcz 55, Gorzow 61, Katowice 42, Poznan 76, Zamosc 42, and Zielona Gora 40. Unfortunately I don't have access to further details such as first names or addresses, so I can't tell you how to find that info. This data indicates the name is found all over the country, but tends to be more common in the western part of the country, in lands formerly ruled by Germany. As for the Krzyzan heraldic figure, I can't tell you anything about that -- heraldry is not a subject I have studied. You might be able to learn more if you post a question to the mailing list Herbarz-L. It is frequented by gentlemen with access to various armorials and libraries, and very often they are able to provide some information on specific noble families and their coats of arms. That's about all I can tell you. I hope it's some help, and wish you the best of luck with your research. 7. Hall of Names International Heritage Classic History Scroll. 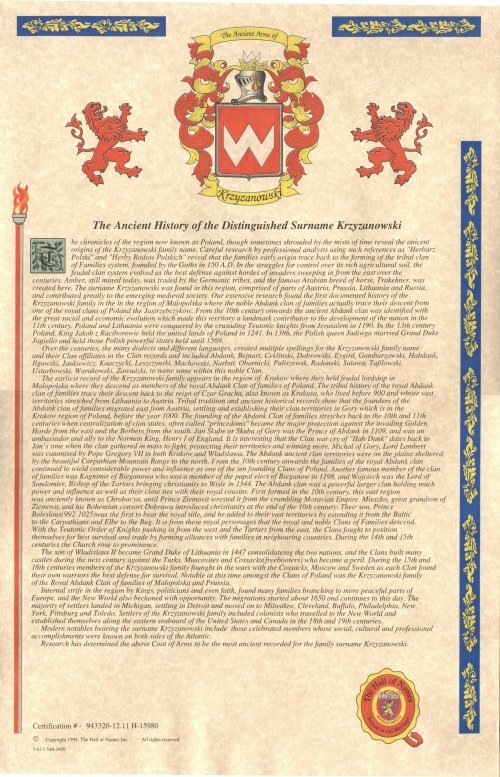 The scroll claims to detail the earliest recorded mention of the Krzyzanowski family surname. If you are looking for a high quality copy of this scroll start your search at http://www.traceit.com and peruse their product offerings. The scroll measures 11"x17" and costs as little as $19.95 (at the time I purchased mine). [ed. note] This company may be out of business! 8. The New World Book of Krzyzanowskis published by Halbert's Family Heritage. Sorry to say but if you get something in the mail telling you that you can get a book just about your name this book just might not be for you. There is nothing in it of specific interest to any Krzyzanowski with one exception. At the end of the book is an International Registry which has addresses for hundreds of Krzyzanowski's around the world along with some demographic statistics. For example, at the time of printing of my copy of the book, there is claimed to be 252 Krzyzanowski households in the United States with the most populous city being Buffalo, New York with 11 households. If you plan to purchase this book, don't have high expectations. The book is printed in the United States and is Copyright&COPY; by Halbert's Family Heritage. From a place near the cross-roads. The bearer of the cross. One who wears the cross. One who is burdened by the cross.